An update on opening hours with the severe weather. It has been decided that all Bodleian Libraries will close at 5pm each day this week. If the weather gets any worse this may change, and we’ll let you know if and when that happens. We have not had any deliveries from the Bodleian van today, and if the weather continues as is I wouldn’t expect them for the rest of the week. 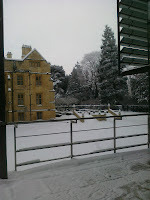 Due to the snow, all Bodleian Libraries (including us) will be closing by 5pm today. A decision will be made later about opening hours for the rest of the week, and we’ll let you know as soon as we know ourselves. The Bodleian van hasn’t made it to us yet this morning with the stack requests, and I’m not sure whether it will, although we haven’t heard yet officially. But if you were expecting stack books here today you might want to save yourself the trudge in! The library will close at 5pm on Thursday 23rd December, and reopen at 9am on Tuesday 4th January. We’d like to wish all our readers a very happy Christmas and New Year – see you all in 2011! As part of the Underground Bookstore and Old Bodleian Library Access Project, work to raise the level of the Old Schools Quadrangle will begin on Monday 20 December 2010 (weather permitting) and continue until the end of April 2011. The quadrangle is in significant need of repair, having last been repaved more than fifty years ago. Access to the Old Bodleian, Duke Humfrey’s Library, Exhibition Room, Shop and Divinity School will not be affected by the restoration work although the Great Gate entrance to the quadrangle will be closed. Some of the work will be noisy and involve use of heavy machinery but the Library will try to limit the noisiest work to vacation as far as possible. Staff will be able to guide you to another library should you wish to find an alternative location in which to study. Please contact reader.services@bodleian.ox.ac.uk if you have any query about this work. The OLIS stack request facility will be unavailable from 6pm on Monday 20th December until the following morning, so that essential file maintenance can take place. Apologies for any inconvenience – if you would like stack books delivered to the VHL on Tuesday morning, please make sure to get your requests in before 6pm on Monday. In 1787, at a time when slavery was crucial to the prosperity and expansion of New York, the New York African Free School was created by the New York Manumission Society, a group dedicated to advocating for African Americans. The school’s explicit mission was to educate black children to take their place as equals to white American citizens. It began as a single-room schoolhouse with about forty students, the majority of whom were the children of slaves, and by the time it was absorbed into the New York City public school system in 1835, it had educated thousands of children, a number of whom went on to become well known in the United States and Europe. The New-York Historical Society’s New York African Free School Collection preserves a rich selection of student work and community commentary about the school. A collection of previously unpublished manuscript documents by, to, or about Alexander Hamilton; that is, all manuscripts we have located that were not published in the major collections of Alexander Hamilton’s papers, including The Papers of Alexander Hamilton, edited by Harold C. Syrett (New York, Columbia University Press, 1961-1987), and The Law Practice of Alexander Hamilton: Documents and Commentary, edited by Julius Goebel, Jr. (New York: Columbia University Press, 1964-1981). The images and transcripts provided here are documents from the New-York Historical Society and the Gilder Lehrman Collection. The digital images of historical documents in this archive preserve the words of hundreds of eyewitnesses to the American Revolution in and around New York City. The letters, newspapers, broadsides, legal records, and maps presented here record events from the early years of the Dutch settlement of New Amsterdam through the British occupation of the city during the Revolution. The images in this digital collection are drawn from the New-York Historical Society’s rich archival collections that document the Civil War. They include recruiting posters for New York City regiments of volunteers; stereographic views documenting the mustering of soldiers and of popular support for the Union in New York City; photography showing the war’s impact, both in the north and south; and drawings and writings by ordinary soldiers on both sides. Digital Commonwealth is an online finding aid to digital collections held in a variety of institutions, libraries and archives throughout Massachusetts. You can browse by subject and location (via a map) as well as search. Records link through to the full-text/image on the owning institution’s site. The twenty-six volumes of the Letters of Delegates to Congress, 1774-1789 aims to make available all the documents written by delegates that bear directly upon their work during their years of actual service in the First and Second Continental Congresses, 1774-1789. A massive collection of documents from 1774-1776 that deal with everything from the conflict with Britain, the process of state creation, political philosophies, the state of the economy, military engagements, clashes between patriots and loyalists, to the lives of ordinary farmers, artisans, slaves, and women. Only 2 of 5 series were ever published. Selections are available online. The VHL holds the print volumes in the stack. The University of Vermont (UVM) Libraries’ Center for Digital Initiatives (CDI) makes unique digital collections available for researchers at UVM and beyond. These collections may be digitized or born digital and may include documents, photographs, data, artifacts, audiovisual materials, and more. Collections can be searched or browsed and include congressional papers and speeches from Vermont members of Congress, photographs, manuscripts and even recipes. The Intelligence Resource Program of the Federation of American Scientists has collected together a large number of intelligence-related documents from the US Governmnent, including directives from the CIA, NSA, and Department of Defense, Congressional Reports, and Presidential directives, from the Truman administration up to Obama. The New York Times blogs the Civil War. Disunion revisits and reconsiders America’s most perilous period — using contemporary accounts, diaries, images and historical assessments to follow the Civil War as it unfolded. Celebrated jazz artists come to life in photographs by William P. Gottlieb. His images document the jazz scene in New York City and Washington, D.C., from 1938 to 1948, a time recognized by many as the “Golden Age of Jazz”. The Library of Congress is in the process of adding all 1,600 images to Flickr. 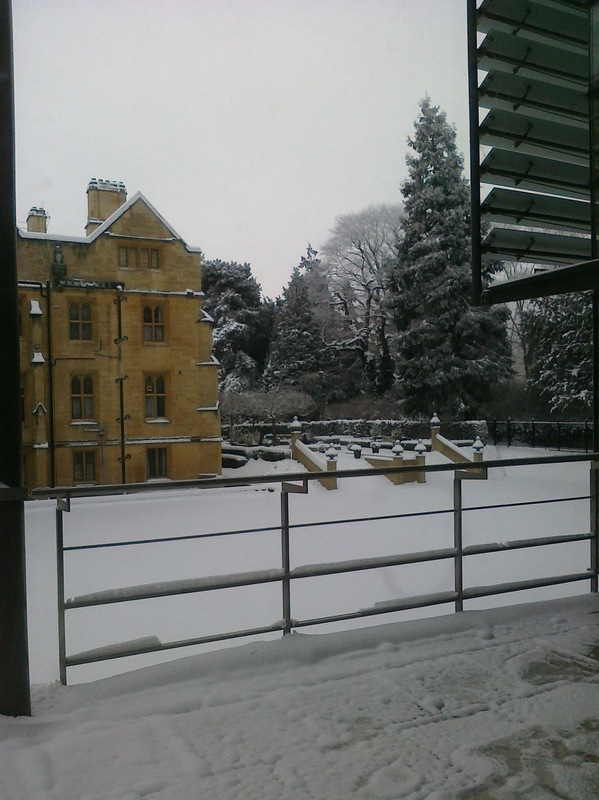 For those who are not leaving Oxford this week, the VHL will be open as usual throughout the Christmas vacation, except for our closed period between Christmas and New Year. We will close at 5pm on Thursday 23rd December, and reopen at 9am on Tuesday 4th January. If you’re going to be away from Oxford over the Christmas vacation, you can still access library electronic resources even when not connected to the University network. There are two ways to do this. One is to sign up for a remote access account with OUCS and install VPN (Virtual Private Network) software on your computer, but if that seems fiddly (or you’ve already left Oxford and not sorted that out), library resources are still accessible to you without it. All you need to do is sign in on SOLO or OxLIP+ using your University single sign-on account, and then click through to the resource you’re looking for – it will know who you are and grant you access as a University member. Now you can enjoy uninterrupted research, no matter where you are! The list of books received in the library during November is now available on our website and LibraryThing page.